A building inside Kalinjar Fort. bl.uk > Online Gallery Home	> Online exhibitions	> Asia, Pacific and Africa Collections	> A building inside Kalinjar Fort. Kalinjar is possibly one of the oldest hill forts in India, occupying a remote site on the last spur of the Vindhya Mountains above the Gangetic Valley, a plateau 375 m (1,230 feet) high. The site was originally a revered hill shrine later fortified and occupied by successive generations of invaders. It was known to have been a stronghold of the Chandellas from the 9th to the 12th centuries. In 1023 Mahmud of Ghazni attempted to seize the fortress but failed. 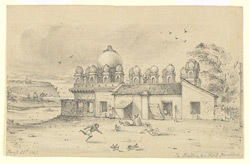 In 1202 Qutb-ud-din Aybak took the fort and destroyed the temples, but Muslim power over the area remained unconsolidated until the rise of the Mughal Empire. Empeor Humayun besieged the fort sporadically between 1530 and 1545. In 1545 Sher Shah Suri marched against the stronghold but died from shell fire. His son Jalal continued the attack and succeeded in capturing Kalinjar. The walls of the fort contain several large tanks including the Budha Badra and Kot Tirth; a palace-like Raja Mansingh Mahal; many Muslim tombs, as well as relics of the Bundelas and Chaubes. The British left a graveyard which included a monument to Andrew Wauchope, the first Commissioner of Bundlekhand.